Venezuela hand-made rugs are extremely soft and trendy. The modern and fashionable colours harmonise with all kinds of soft furnishings and are a true all-rounder where décors are concerned! The 600 design in lavender, silver and black contains sparkling fibres of Lurex, these add a touch of glamour to your room, depending on the incidence of light. 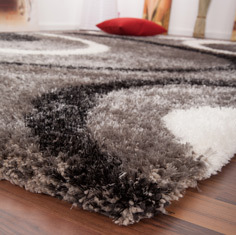 Thanks to their synthetically fibres these hand-made these rugs are very easy to clean and durable - and especially soft.